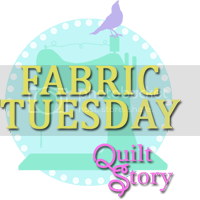 I just wanted to share this bag again for Quilt Story's Fabric Tuesday. It's a terribly simple pattern - I think it took me only a couple of hours to make. It's the Pick a pocket bag from Allpeoplequilt.com. I even bought extra of the two black and white fabrics because I loved them so much. The bag was super easy to cut out, layer and sew together, even though I'm really not used to sewing that many layers at one time. I think if I were to make it again, I'd make some changes to it - first off, making it larger - but it's such a sweet little bag that I can't help loving it. And the batting it uses makes it really work well as a slightly insulated lunch bag. Love your little bag! I have a smallish bag that I made, thought it was too small at first, but now I love it!